Our Goal | Right To Play, Inc.
ALL CHILDREN DESERVE A SPECIAL PLACE TO PLAY WITH FREEDOM; WITHOUT FEAR, FRUSTRATION OR RIDICULE. Our initial goal of designing, funding and building a magnificent playground has been met. We continue to help the City maintain the Leaps and Bounds Playground. Current Goal: Leaps and Bounds Playground will serve as an example for other communities. 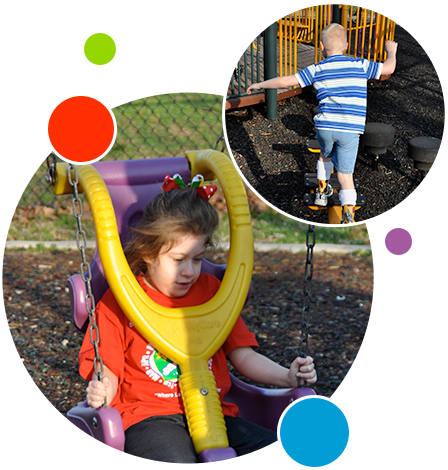 Outdoor play is important to all children, regardless of their physical or mental abilities. All children deserve access to playgrounds that provide rigorous and challenging fun. Through play, children develop their language skills, decision-making abilities, social interaction strategies, and physical, sensory and cognitive strengths. Today, our hectic lifestyles as well as the increased focus on academic and structured activities, leaves very little time for undirected play in a safe, outdoor environment. Children learn creativity, dexterity, how to work in groups, to share, negotiate and resolve conflicts when given access to a challenging playground. A balance must be met between academics, structured activities and carefree, child-driven play. Right to Play, Inc. does not design or fund projects for other communities. We welcome visitors to contact one of the board members to arrange a tour of the playground or talk to you about our project and share the process we went through to fund, design and build our Leaps and Bounds Playground. © 2019 All Rights Reserved Right To Play, Inc.